Rap Icon, Rick Ross welcomed a baby boy with his fitness model girlfriend, Brianna Camille, name him 'Billion' Leonard Roberts. The 42-year-old rapper who already shares a daughter with Camille took to his Twitter account to share the good news. 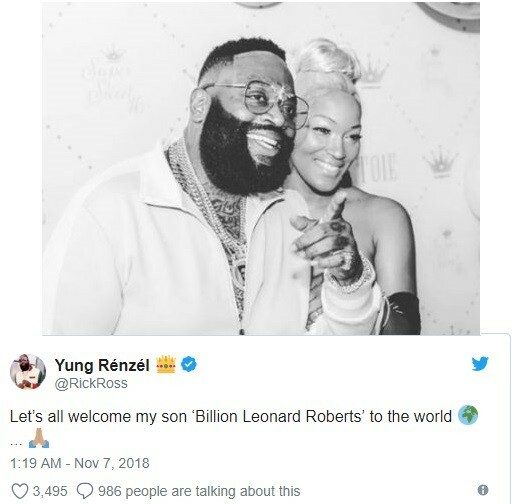 The latest addition is Rick Ross' fourth child. The rapper has two other kids, a daughter, Toie Roberts, whose mom is Lastonia Leviston and a son, William Roberts III, whose mother is Tia Kemp.